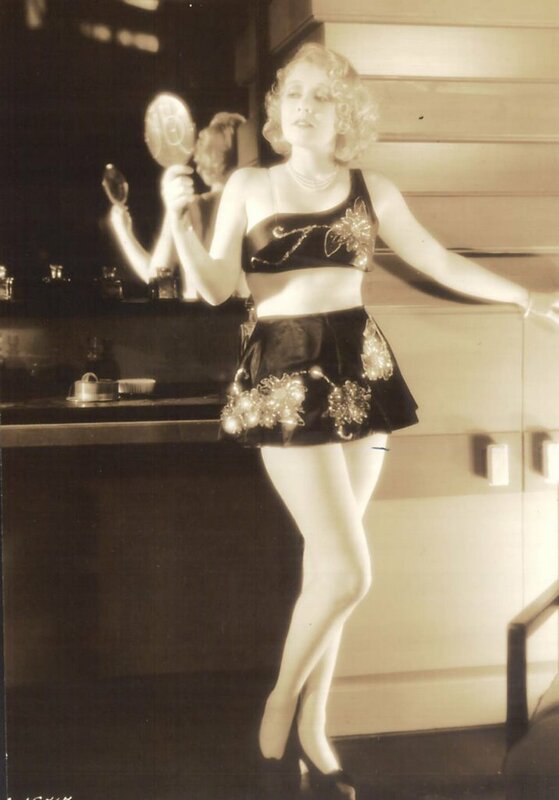 If Joan Crawford had flashed hot and burned out by 1930, she’d be Anita Page. But even if Anita had pushed harder and been luckier, she’d not likely have enjoyed the forty plus years of fantastic stardom Crawford carved out. These two are the perfect example of one who delivered over the long haul, and another who just couldn’t pack the gear. Anita ended up the footnote … Joan the legend. On the other hand, Anita’s had 95 years and counting. So who was the lucky one? Between stardom and living longer, I’ll always take the latter, but I’m not sure Joan would have. That’s how bad she wanted it. Anita can watch The Hollywood Review Of 1929 today with the satisfaction of knowing that out of that entire, monumental cast of MGM stars, she is the last and only survivor. That’s gotta be one helluva sensation. To hear Anita tell it, she got all the breaks from the moment she walked onto the Metro lot in 1928. Crawford had to struggle, do extra work, nameless bits, God knows what else. All Page had to do was show up. MGM took the seventeen-year old straight in to do a screen test with one of their biggest names, William Haines, and within days, she was signed and playing the lead opposite him in Telling The World. That must have been one amazing screen test! I don’t know of another Metro player who went to the head of the class so quickly. So just what kinda magic did this gal have? A lot of people have written about the transition period from silents to talkies. Anita Page lived it. Her second MGM appearance found her playing a bad girl/drunk in Our Dancing Daughters, the seminal flapper-thon that among other things, put Crawford on the front studio burners. Anita’s on-screen dipso breakdown was altogether the product of imagination, so says she, as the teenage star had not yet permitted the demon rum to cross her virgin lips. It’s the same story you get in every silent era actress interview. They never drank --- mother always chaperoned on dates --- no man so much as touched the hem of their garment, etc. Really dullsville, and a tough swallow when you consider the law of the jungle those Metro predators were known to live by. Maybe Anita’s minor status saved her, at least initially. None of those guys wanted to go to jail, after all. As to her later fox amongst hounds experience, Page stripped off the gloves during a 2000 interview and spilled the dirt on a number of co-workers and obsessive fans. Seems Irving Thalberg was just nuts about her. Even wanted to leave Norma and marry Anita --- and yes, that flies in the face of everything I’ve ever read about Irving, so I’m a little skeptical. Nemesis Crawford put the make on our girl during one of their co-starring gigs, but of course, Anita would have none of it. Various interviews suggest Joan pulled that number on a lot of her female co-workers --- but wouldn’t it be great if just one of them would surprise us and say, "Oh yeah, baby. Joanie came on to me, and lemme tell ya, it was great!" --- I mean, surely one of Joan’s crushes over all those years put out! So anyway, Benito Mussolini (yeah, the Italian dictator guy) flipped for Anita and deluged Culver City postmen with near-daily proposals of marriage for the actress he idolized, but never met. She later speculated that WWII could have been averted if only she’d gone for the deal and thus stabilized her despotic admirer. Bear in mind, this was a late-in-life interview (but what’s "late-in-life" when you’re Anita Page?). I saw Anita Page in a Burbank restaurant a few years ago. This woman who once co-starred with Lon Chaney Senior, played opposite Buster Keaton in his talking debut, appeared with Clark Gable in his very first MGM picture --- was now eating a twenty-first century cheeseburger at the Holiday Inn. Unbelievable. Even more so the fact that she might be doing the same thing tomorrow. What must it be like to live that long? Think about it as you look at these photos, all of them dating back a minimum of seventy-five years. The tigress pose with John Mack Brown is from Our Dancing Daughters, and she may well be the best thing about this show. Lon Sr. gave Anita acting tips in While The City Sleeps, a Chaney I’ve not seen but would like to. Everyone laughs at The Broadway Melody and calls it a stiff, but in early 1929, this was a marvel of early talkie sophistication, and a willingness to watch within that context bears much reward, not least of which is Anita and Bessie Love peeling off to no purpose other than giving the pre-code audience just what it came to see. 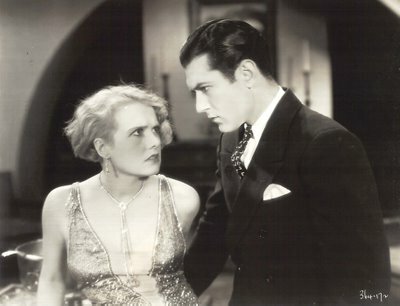 Truck-driving Clark Gable was on the ascent when starting-on-a-decline Anita paired with him in support of stars Constance Bennett and Robert Montgomery in 1931’s The Easiest Way. 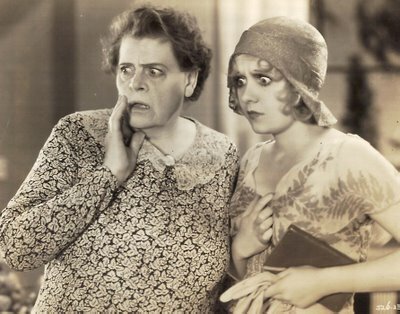 From here, it was thankless background work for star comedians (including Marie Dressler, shown here with Anita in Reducing) that any actress on the lot could have filled, but who’s complaining when it’s Buster Keaton at the clowning helm (here in Sidewalks Of New York)? MGM had an odd tendency to pose Buster as though he were Ramon Novarro for some of those publicity stills with his leading ladies, but it's a nice effect all the same, as this was how a lot of women viewed Buster (still do --- he has a considerable distaff following today). Despite Anita’s efforts at explanation, I still wonder what went wrong for her at Metro. Did she just step down when she married songwriter Nacio Herb Brown in 1934? Not likely, as she was out of MGM at least a year prior to that. Maybe it was a distinct Queens accent that hampered her range beyond urban settings, or maybe, like Dorothy Sebastian, Mary Nolan, Madge Evans, and so many others, she just got winnowed out. There’s only so much room at the top, after all, and an actresses’ shelf life was, then as now, a limited one. In any case, Anita’s proposed title for her autobiography, Anita Page:The Last Great Silent Star, may not be altogether justified by the facts, but when you’ve been around as long as she has, perhaps you can afford to toot your own horn a little louder, especially when the rest of the orchestra has long since filed out of the auditorium. Excellent post once again. I too have wondered over those Buster Keaton photos from the MGM period, but I must say I did like this photo and yes I am one of those distaff followers. I've not seen a lot of Anita except in comedy roles. You mentioned that she is the last surviving cast member of The Hollywood Review of 1929; I wonder what she really thinks about that! And if only did did avert WW2. Know how I could write to her by chance? As always, your site is fantastic! I'm a big Anita Page fan, so this post was particularly welcome. As always an extremely interesing article. I kill more time reading this and saving some of the articles. I'm tempted to save all of 'em 'cause there's stuff there I've never seen before. "Nemesis Crawford put the make on our girl during one of their co-starring gigs, but of course, Anita would have none of it. Various interviews suggest Joan pulled that number on a lot of her female co-workers --- but wouldn’t it be great if just one of them would surprise us and say, "Oh yeah, baby. Joanie came on to me, and lemme tell ya, it was great!" --- I mean, surely one of Joan’s crushes over all those years put out!" Now that's funny and I too have wondered that.